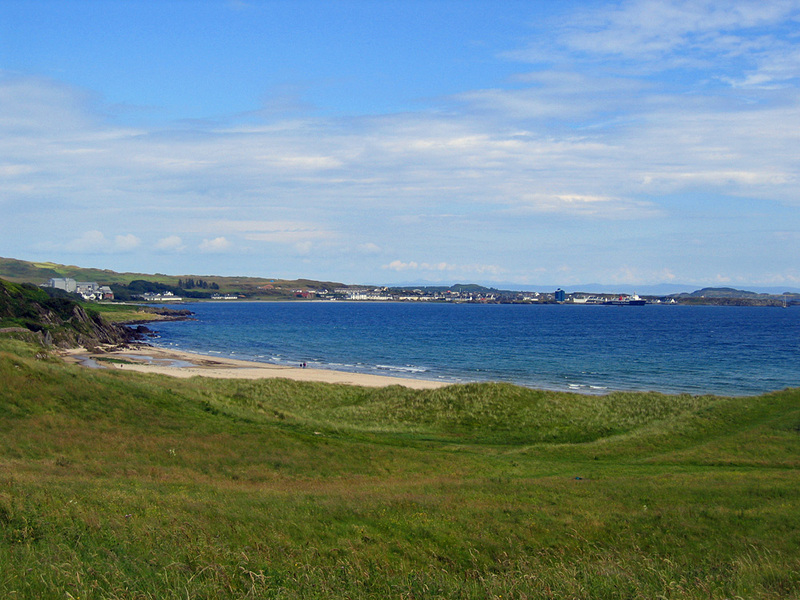 A view over Kilnaughton Bay and Port Ellen on the other side of the bay from the dunes behind the beach. Kilnaughton beach just below, partially hidden by the dunes. The pier with one of the Calmac ferries serving Islay on the right. Port Ellen Maltings and the distillery warehouses on the left. In the background in the far distance the hills of the mainland. This entry was posted in Beaches, Cloudy Weather, Distilleries, Landscape, Repost, Sunny Weather, Village and tagged Islay, Kilnaughton Bay, Port Ellen, Port Ellen Distillery, Port Ellen Maltings by Armin Grewe. Bookmark the permalink.